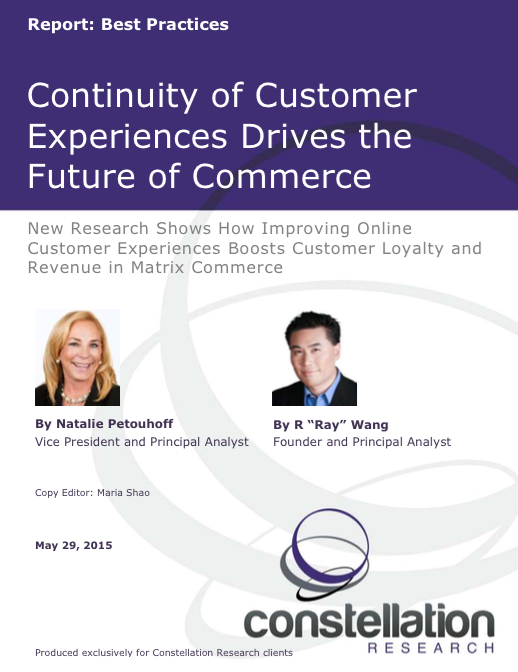 Continuity of Customer Experiences Drives the Future of Commerce | Constellation Research Inc. In a recent survey over 150 marketers, e-commerce, customer service and online professionals reported that their e-commerce system did not satisfactorily drive customer loyalty, and consequently, revenue1. 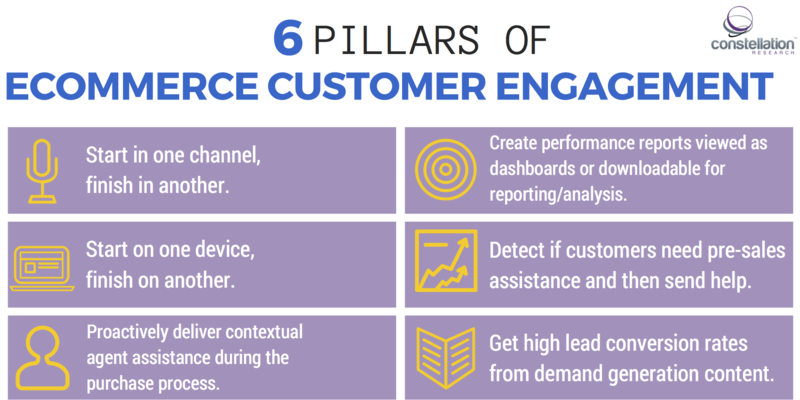 This report highlights best practices required to deliver superb online customer experiences and explains how to design and deliver those experiences so you can outperform your competition. 1This research report surveyed over 150 marketers, e-commerce, customer service and online professionals and companies whose revenue was between $500 million to $2 billion a year.1 The research spanned B2C, B2B and B2B2C companies in various industries in both the United States and the United Kingdom and examined the customer experience and customer service versus the e- commerce experience. Of significance, brands could not tell who their most profitable customers were, which channels those high value customers came from, and what products their customers were interested in or had previously viewed. The study showed that only 37 percent of the U.S. brands and 28 percent of the U.K. brands rated their organization’s ability to achieve its e- commerce goals as very effective. As a result, most brands and organizations lacked the ability to convert a large portion of prospects into revenue-producing, loyal customers who could continuously provide revenue for the brand. This survey report provides online businesses with insights into e-commerce challenges, tools used for success, and plans for e-commerce usage in 2015-2020. The goal is to ensure better experiences and understand what experience-driven continuity means to online business leaders, learn how organizations rate their own brand’s online experiences today, discover what they do to engage with customers across devices, and find out how organizations would rate the emotional connection that customers have with their brand online. Clients should use this document as a best practices guide in planning for the developing online customer experiences required for success to drive enhanced revenue in matrix commerce initiatives.